The collaborative video highlights the label’s talented roster. Lust, love, jealousy, anger, fear and repentance are what drives forward the inventive new short film from Mind of A Genius (MOAG), the LA based label. The film features a soundtrack off artists from the label. THEY.’s “Bad Habits,” Klangstof’s “Sleaze,” and Gallant’s “Bone And Tissue” are featured as a young couple works their way through a Bonnie and Clyde romance one night on the streets of Los Angeles. MOAG wanted to make the video as a way to showcase the wide variety of talent on the label. There are even cameos from each of the artists in the film. The production of the film, which was done in partnership with Motion Family, is part of a larger roll out that includes the launch of MOAG Compilation Album Vol. 1. The album will be specially released on vinyl and include tracks from each of the artists on the label. "Grace and I were speaking about what's a really cool, different idea we could do together," said Mind of a Genius C.E.O. 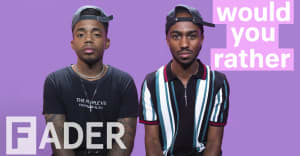 and Founder David Dann to The FADER. "I was mentioning how much I want to get into music supervision later in my career and we started talking about the aesthetic of MOAG and how cool it would be to do a short film around some of our artists - and boom, idea was born!" as well as exclusive products from the label, including Issue No. 1, Mind of a Genius Magazine + Mind of a Genius Vol. 1, a vinyl with music from the entire label, and a limited edition merch collection. The pop-up will be in Los Angeles on March, 10 and will also include a listening experience of unreleased music from the MOAG roster, including the newest MOAG act. Watch the full video above, and for additional information on the upcoming pop-up, visit Mind of a Genius' website. Electronic, Gallant, Hip-Hop, Klangstof, They.